Over the last two days, many Avalanche fans have been highly critical of GM Greg Sherman's decision to give up a first round draft pick (one that might be a lottery pick next June) for a goaltender with injury woes and very little experience. I have to admit, it's been hard to wrap my head around this deal. Actually, it's been hard for me to wrap my head around many of Sherman's deals. I'm still not over Sherman's trading of young Colby Cohen (physical defenseman with a booming shot) for Matt Hunwick. And trading JM Liles for a second round pick, followed by re-signings of Kyle Cumiskey and the aforementioned Hunwick? Some of these decisions are beyond perplexing. Bloggers take a lot of heat for acting like experts when they're really just fans with above-average typing abilities, but if Matt Hunwick outplays John-Michael Liles this season, I'll shut this blog down and become a Leafs fan. But I think fans are overreacting to the Varlamov deal. Instead, I'm siding with Jibblescribbits' view of the situation. But those weren't the moves that made headlines today. The Avs, who were in the middle of the rebuild, traded a 1st & 2nd, round pick for the young, talented, and slightly injury prone, goaltender Semyon Varlomov. And the trade did more than give the Avs the #1 goaltender they craved. The trade ends phase one of the Avalanche rebuild. The first round pick is a ridiculous price for an RFA that the Avs could have just as easily signed for the modest compensation of a second round pick, but only if the Avs end up in the league's cellar for the second year in a row. Looking at the roster that Sherman has assembled, does that seem likely? Some argue that most of the Avs' troubles last year came from the ridiculous amount of injuries that the teams faced. I argue that the epic second half collapse stemmed from putrid goaltending and an undersized group of forwards and defensemen (especially defensemen). Management has taken steps to correct these problems. 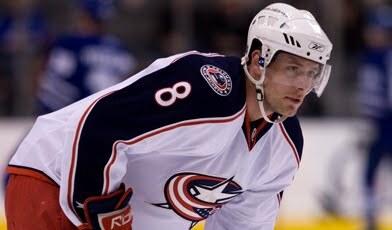 Former Columbus rearguard Jan Hejda (6-3, 229) joins Erik Johnson (6-4, 236), Ryan O'Byrne (6-5, 234), Kyle Quincey (6-2, 207), and probably Ryan Wilson (6-1, 207) -- five defensemen who are big, physical, and can land big hits to forwards entering the zone and in the corners. Don't forget about Stefan Elliot, Tyson Barrie, Cameron Gaunce, Joel Chouinard, and yes, Cumiskey and Hunwick, as the candidates to fill that sixth spot. The loss of Liles is tough in terms of the leadership he brought to the team, but this group of defenseman will undoubtedly be tougher to play against in 2011-12. In goal, Varlamov is a huge risk. That much is obvious. But with high risk comes high reward. 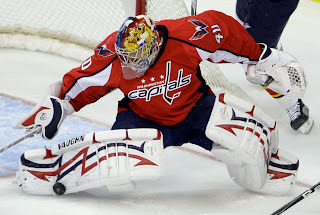 His 30-13 NHL record is impressive, as was his .924 SV% last season. At 23, he may well be the long-term solution for the Avalanche. Of course, we said as much about Craig Anderson this time last season. Only time will tell. I'm actually much more excited about the addition of Giguere. He's an experienced veteran (when's the last time you could say that about an Avalanche backup?) who won't make us hold our breath every time a puck is shot. He seems excited about coming to Denver and appears to have embraced his role as a mentor to Varlamov. Overall, this offseason has yielded a possible future star (Landeskog), bigger defensemen (Hejda, Siemens), and a possible franchise goaltender (Varlamov). The costs seem high now, but they'll be much lower if this team is able to make some noise in April. For now, this judge has ruled in favor of optimism and positivity.